Post-construction cleaning needs special methods and equipment like filtration vacuums, steam cleaning machines, and floor scrubbers along with the skill set to ensure that the dust and debris does not return in your newly constructed or remodeled building. 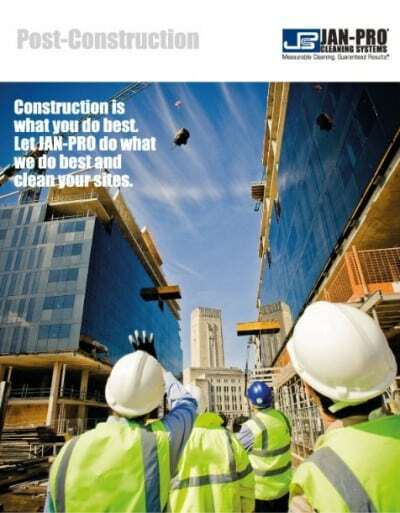 JAN-PRO has special post-construction cleaning crews, who are trained for cleaning the newly constructed buildings completely in all aspects before the new occupants enter the building. Your building’s debut is of utmost importance and with JAN-PRO post-construction cleanup, the interior and exterior of your property will not only look clean, but also smell fresh and instill a sense of pride among the dwellers. Cleaning and sanitizing of all bathtubs and tub surrounds, shower stalls, sinks, toilets and other required areas. Cleaning of doors and frames. Cleaning of inside cabinets and drawers. Cleaning or wiping of all lighting fixtures. Dusting and cleaning of all rooms. Dusting or wiping of all furniture. Remove all paint, glue, stickers from glass. Remove dust from baseboards and all woodwork. Sweeping, vacuuming, washing or scrubbing of the floors. Thorough vacuuming of all dusted surfaces.